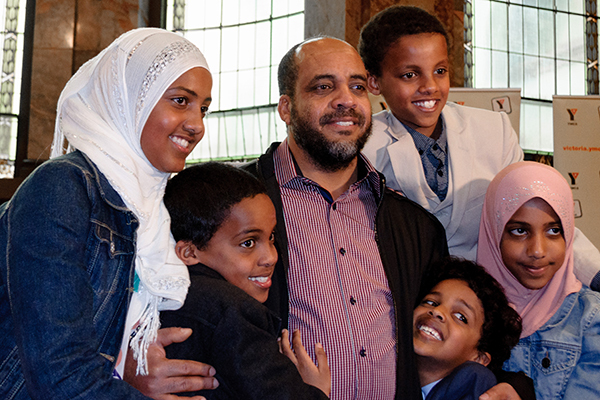 The Father’s Day Council of Victoria has announced Abubeker Mohamed as Victoria’s Father of the Year 2015 | Father's Day Council of Victoria Inc. The ceremony was held in the chambers of Melbourne Town Hall, attended by Lord Mayor Robert Doyle, Father’s Day Council Chair Don Parsons, YMCA Victoria Chair Anthea Hancocks, YMCA Victoria CEO and Deputy Chair of the Victorian Father’s Day Council Peter Burns, as well as Abubeker’s family and friends. Abubeker pictured with five of his children. Wife Suad and the two youngest children were not able to attend. Abubeker migrated to Australia in 1996 from the African country of Eritrea, moving to Wonthaggi a decade later to raise his family. He and his wife Suad have seven children, aged between two and thirteen years old. Abubeker first came to the attention of the Father’s Day Council through their centre’s local YMCA Community Father of the Year. He is a loving dad who has put his family first, ensuring they have the best educational opportunities and access to swimming and water safety lessons. In his acceptance speech, Abubeker thanked YMCA staff at Bass Coast Aquatic and Leisure Centre, as well as his family and friends. Presenting the award was Lord Mayor Robert Doyle who recognised how important dads and father figures are in the Victorian community. In 1910, the YMCA founded Father’s Day and we have continued to support and celebrate the important role they play in the community.